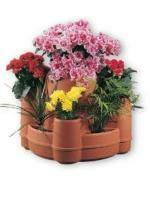 Plastic plant pots are increasingly in demand as they are gradually superceding most other types of pots when it comes to growing plants. Overall they are extremely durable, but can break if lifted by the rim when full. They are ideal for growing a variety of plants and vegetables, and they are used extensively for growing tomatoes, peppers, and cucumbers and the like, although for displaying flowers and small shrubs you may prefer something more decorative. The upside is that plastic pots are easy to keep clean, and do not dry out as quickly as clay and terracotta pots tend to. They are not particularly expensive to buy, but if you need a lot then the bill can still add up to quite a lot. The Mayan Garden container shown here resembles an adobe cliff dwelling that encourages the best and most intensive use of a limited amount of floor space. It's possible to create a complete vegetable herb garden in just 21 inches of floor space. If you are starting off seedlings and bringing on plants, you can of course save money by using the empty plastic cartons from the kitchen instead of throwing them in with the trash. Pots and planters are a great way to display your plants indoors and outdoors, and garden pots can help to create a feature in your garden to make a good garden great. In the garden they can add interest and height by making it possible for plants to lifted to varying levels as required. Plant Pots are also a wonderful way of enabling you to rotate your plants throughout the year, giving a continuous display of color and greenary as the seasons change. If you want pots that are more appealing than plastic ones then these Ceramic Jade Garden Planters are very attractive, and good quality too. The larger one is even bigger than I expected with a 10 inch opening and stands 9.5 inches tall. 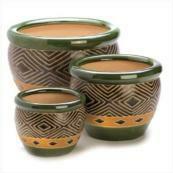 The medium one is the size of most larger pots that you get in sets of 3 pots that are similar. The whole set is really superb.